Printer drivers are still one of the most common problems/challenges on a Terminal Server environment. Nowadays there a several products to solve this problems, using a universal printer driver. A disadvantage of most products is that the printer are used, which are defined on the client (client printer mapping. The print job is in this situatiions send to the client, which processes it and send it to the printer or printer server. In case of a print server again the job is send on the network to the printer server and finally to the printer. Obviously Thinprint can do this, but much much more. For example Thinprint support Dedicated Printer Servers, NAT, Client gateways, compression, bandwidth control and more. As described above Thinprint can be used in a lot of environments. Consider the necessary components for your environment first. Every solution requires other components or place of the components. All installations are pretty comparable to each other. All components are installed using the same installation source (except the clients), the installation is started using the setup.exe. In the first selection it is obvious Thinprint has it roots in Germany, because you need choose English or German language. After accepting the license agreement the main screen appears with all components. Select the desired component and continue with the installation by the verifying compatibility screen. If this is the first installation on the server you need to add the license for the product. The required files are copied and the installation is finished. A compliment for Thinprint for setting up a separate document how to install all the server components unattended (look in the whitepaper section on the website). We decided to install the the ThinPrint .Print Server Terminal Services Engine in combination with .Print Client Gateway (services). In this way we accomplish compression to the Client Gateway and driver free Terminals Servers. After the installation the configuration starts. All products does not need to much configuration and the look and feel is almost the same for all products. Our solution needs configuration on the Client Gateway and the Terminal Server. 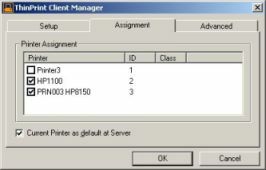 On the Client Gateway (which will be used as printer server) we need to install all the printers with their drivers. After installing an additional printer you need to restart the Thinprint Client services, so the added printer is available within Thinprint. Clicking on the Thinprint Icon in the taskbar shows all printers with their ID (this ID you need for further configuration on the TS server). First if needed you can add additional Thinprint ports. It is no problem to connect more than one printer on one Thinprint port. After adding you need to setup all printers on the Terminal Server. This is a manual process just like adding a normal printer. Adding the printer you choose the Thinprint port and the Thinprint Output Gateway printer driver. Then you need to choose the printer name. Follow here the following convention <servernaam/ip-adres>:<PrinterID>#<Printername>. 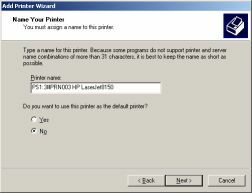 The printer name can be set if wanted, so you user your naming convention or a short other description. As you see this is lots of work, because you need to add a new printer on two places. If you have more than one printer server or Terminal Server you need to at least once more. Although it is pretty easy to setup-up a script (copy directories and importing registry keys) to distribute the printer configuration, it would be nice if Thinprint adds an export and import function for this configuration part. On the clients no additional management is available, except event log reports. If using the client as in our review it would be nice if you get at least the same information as in the server products. On the server based products there is tab called Job Statistics. Standard the options are disabled, but you enable them so additional information is available about the jobs especially about the compression of the jobs. For troubleshooting and reporting purposes it would be nice if Thinprint adds monitoring functionality. User will not notice much about using the Thinprint software. The printer name looks a little bit different (adjustable within the Thinprint configuration) and the printer has no network icon anymore (because the printer configuration in our review environment is now locally configured on the Terminal Server). Because Thinprint support duplex and tray selections user will be pretty satisfied with the Thinprint solution. If they are working on a branch office with limited bandwidth they will notice definitely the compression on the jobs. Thinprint offers a very complete solution useable in almost every environment concerning printer problems and issues. All components like one printer driver, compression, bandwidth control are available and a lots of settings are possible like Dedicated Printer Server, Dedicated Printer Server over RDP/ICA, Client Gateways, Thinprint Hardware. Because of the many possibilities in the beginning it is a little bit confusing which products you need on which system. Also configuration could be a little bit improved with import and export functions and would we like to see some more monitoring and management options. Nevertheless this is (as we know) the most complete Printer solution for SBC (and more) environments.